29294 -- "Freight Train" Starter Set. Model: The locomotive has a digital decoder and a metal frame. 1 axle powered. Traction tires. The low side car and the “Shell” tank car have Relex couplers. Train length 33.8 cm / 13-5/16”. Powerful locomotive with a decoder for multi-train operation. Cars include Relex couplers for easy uncoupling. Oval of C Track with sturdy, finely detailed roadbed for fast setup and takedown. Compatible with the entire C Track system. 29660 -- "Norway" Digital Starter Set. Prototype: Norwegian State Railroad (NSB) class Di 3 diesel locomotive (NOHAB general-purpose diesel electric locomotive), two NSB passenger cars, 2nd class, and one NSB baggage car. Model: The locomotive has an mfx digital decoder, controlled high-efficiency propulsion, and extensive sound functions. 3 axles powered. Traction tires. The triple headlights change over with the direction of travel, will work in conventional operation, and can be controlled digitally. The cars have close couplers with guide mechanisms. Train length 88.3 cm / 34-3/4". Contents: 14 no. 24130 curved track, 9 no. 24188 straight track, 9 no. 24172 straight track, and 1 pair of no. 24671 and no. 24672 turnouts. A track connector box, a 230 volt / 36 VA switched mode power pack, and a Mobile Station are included. Also included is an illustrated instruction manual with many tips and ideas. This set can be expanded with the C Track extension sets and with the entire C Track program. mfx digital decoder with extensive sound functions built in. Prototype: German Federal Railroad (DB) passenger train and freight train. A class 011 coal-fired steam locomotive with a tender and a class 216 "Lollo" diesel locomotive. 1 type Am 203 passenger class, 1st class, and 2 type Bm 234 passenger class, 2nd class. Freight train includes 5 different freight cars. A type Kbs 443 stake car, a "VTG" petroleum oil tank car, a type Eaos gondola with a "coal" load insert, a type Gbs 245 boxcar, and a type Fad 168 side dump car. Model: Both locomotives have mfx digital decoders and extensive sound functions. They also have controlled high-efficiency propulsion. Traction tires. The locomotives have headlights that change over with the direction of travel, will work in conventional operation, and can be controlled digitally. Total length of the passenger train: 112.3 cm / 44-1/4". Total length of the freight train: 93.8 cm / 36-15/16". Contents: Large C Track layout with 3 turnouts. A Central Station is included. A 60 VA switched mode power pack is included to power the Central Station and accessories. Hardware for setting the layout up is included. Extensive instructions for setup and operation are included. Getting started digitally for demanding people: 2 complete trains, a large track layout, and a Central Station. One-time series for the 2013 MHI. Prototype: German Federal Railroad (DB) class 03.10 express steam locomotive. Non-streamlined rebuilt version with a new, high performance boiler, Witte smoke deflectors, DB Reflex glass lamps, and a rebuilt tender with coal bunker hatches, and stoker equipment. The pilot truck has spoked wheels like the prototype. Road no. 03 1012. The locomotive looks as it did around 1961. Model: The locomotive has an mfx digital decoder and extensive sound functions. It also has controlled high-efficiency propulsion with a flywheel, in the boiler. 3 axles powered. Traction tires. The locomotive and the tender are constructed chiefly of metal. A 7226 smoke generator is factory installed in the locomotive. The triple headlights change over with the direction of travel. They and the smoke generator will work in conventional operation and can be controlled digitally. The headlights are maintenance-free, warm white LEDs. There is a close coupling with a guide mechanism between the locomotive and tender. There is a close coupler with a guide mechanism and NEM coupler pocket on the tender. The hatches for the coal bunker can be opened and closed. Minimum radius for operation 360 mm / 14-3/16". Piston rod protector sleeves and brake hoses are included. Length over the buffers 27.5 cm / 10-13/16". Express train passenger car set to go with the locomotive available under item number 43918. 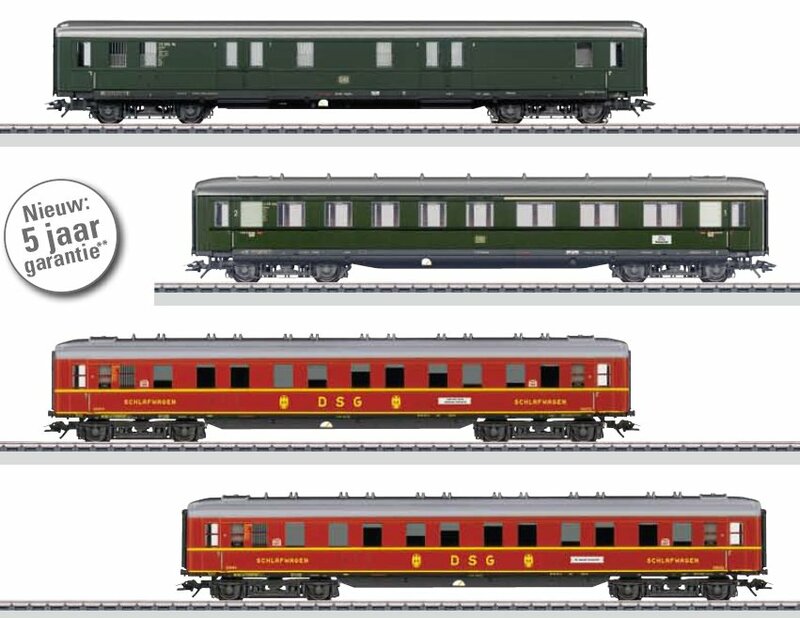 A suitable express train passenger car set for the long distance express "F-Zug 4" "Merkur" is also offered under item number 43918 exclusively for the "Exclusiv" / "MHI" program in the Märklin assortment. Prototype: Union Pacific Railroad (UP) class 4000 "Big Boy" heavy freight locomotive. Version with the road number 4014, cooling pipes, and authentic weathering. The locomotive looks as it did around 1948. Model: The locomotive has an mfx digital decoder and a sound generator. It also has controlled high-efficiency propulsion. 8 axles powered. Traction tires. The locomotive has an articulated frame enabling it to negotiate sharp curves. It also has Boxpok driving wheels. The middle driving axles are spring-loaded. The headlight, backup light on the tender, and the number board lights are maintenance-free, warm white LEDs. 2 smoke generators (7226) can be installed in the locomotive; the contacts for them are on constantly. The headlight, backup light on the tender, the number board lights, and the engineer's cab lighting will work in conventional operation and can be controlled digitally. There is a powerful speaker in the tender and the volume can be adjusted. Coupler hooks can be inserted in the pilot on the front of the locomotive. There is a close coupling between the locomotive and tender. Steam lines are mounted to swing out and back with the cylinders. The locomotive has separately applied metal grab irons. There are many separately applied details. Figures of a locomotive engineer and fireman for the engineer's cab are included. Length over the couplers 46.5 cm / 18-5/16". The locomotive comes in a wooden case. Prototype: German State Railroad Company (DRG) class 18.3 (former Baden IV h) express steam locomotive with a tender. The locomotive looks as it did around 1929/1930. Model: The locomotive has an mfx digital decoder and extensive sound functions. It also has controlled high-efficiency propulsion with a bell-shaped armature and a flywheel, mounted in the boiler. 3 axles powered. Traction tires. The locomotive and tender are constructed mostly of metal. A 72270 smoke generator can be installed in the locomotive. The dual headlights change over with the direction of travel. They and the smoke generator that can be installed in the locomotive will work in conventional operation and can be controlled digitally. Maintenance-free, warm white LEDs are used for the lighting. There is a close coupling between the locomotive and tender that can be adjusted for the radius of your curved track. There is a close coupler with an NEM pocket and a guide mechanism on the tender. Minimum radius for operation 360 mm / 14-3/16". Protective piston rod sleeves and brake hoses are included. Length over the buffers 26.7 cm / 10-1/2". The units stationed at Offenburg were the flagship express locomotives on the Rhine Valley route and were often seen on the point of the German State Railroad's new deluxe train, the Rheingold. Maffei designed four-cylinder compound running gear for the IV h. The inboard cylinders were positioned way up to the front and gave the locomotive its unmistakable look. The tender also contributed to the characteristic look of the locomotive. It was unusually short with a truck and two axles mounted close to each other in the frame for the tender. A set of express passenger cars to go with this locomotive can be found in the Märklin H0 assortment under item number 41929. Prototype: German Railroad, Inc. (DB AG) class 101 express locomotive. With the slogan on the sides "END POLIO NOW", the major theme of Rotary International in the fight against this crippling childhood disease. The locomotive looks as it currently does in real life. Model: The locomotive has an mfx digital decoder, controlled high-efficiency propulsion, and extensive sound functions. It also has. 2 axles powered. Traction tires. The trucks have movable reproductions of the mechanical gear for steering them. The triple headlights and dual red marker lights change over with the direction of travel, will work in conventional operation, and can be controlled digitally. The long distance headlights can be controlled separately. The headlights at Locomotive End 2 and 1 can be turned off separately in digital operation. When the headlights are turned off at both ends of the locomotive, then the "double A light" function is on at both ends. The lighting is maintenance-free, warm white and red LEDs. Length over the buffers 21.9 cm / 8-5/8". Prototype: 6 different German State Railroad Company (DRG) "Rheingold" express train passenger cars in the paint scheme at the start of the Thirties. 1 type SPwrü-28 baggage car, 1 type SB4ük-28 express passenger car, 2nd class, with a galley, 1 type SA4ü-28 express passenger car, 1st class, without a galley, 1 type SA4ük-28 express passenger car, 1st class, with a galley, 1 type SB4ü-28 express passenger car, 2nd class, without a galley, and 1 type SPw4ü-28 baggage car. Model: The cars are highly detailed models with raised lettering, including "Rheingold" lettering on the cars, separately applied grab irons, and interior details in different colors. There are retracted diaphragms with crossover plates folded up for the end cars in the set. The table lamps and the marker lights work and can be controlled digitally by installing a function decoder in the baggage car. The 73400/73401 interior lighting kit (2 per car) can be installed in the cars. The cars have a guide mechanism with current-conducting close couplers. Total length over the buffers: 153 cm / 60-1/4". Passenger cars with raised "Rheingold" lettering. The Rheingold - Traveling like Kings. After the catastrophe of World War I and the political upheavals in Europe, traveling began to grow again in popularity. The railroad was used almost exclusively for long distances, since it promised a fast, comfortable mode of conveyance. The sleeping and dining car firms run under private ownership dominated in long distance service. They offered an extensive palette of services up to and including the ultimate luxury. The German State Railroad Company (DRG) did not want to sit on its hands and do nothing with regard to its competition, and this new, self-confident firm was determined to underscore its presence on European rails with a deluxe train possessed of an international quality. In 1927, the German State Railroad officially disclosed the order for express train passenger cars to form long distance express trains, which were intended to represent innovation and comfort by rail. The "Who's Who" of the German car building industry participated in the building of these cars, among others, the firms Waggon und Maschinenfabrik AG, Görlitz and the Waggonfabrik Wegmann & Co. A total of 26 Rheingold parlor cars were built: 4 cars, 1st class, type SA4ü, with seating for 28, 4 cars, 1st class, type SA4üK, with a galley and seating for 20 8 cars, 2nd class, type SB4ü, with seating for 43 10 cars, 2nd class, type SB4üK, with a galley and seating for 29. For their time they represented the longest German cars with a length of 23.50 meters / 77 feet 1/3/16 inches. The bodies were constructed entirely of steel and the total weight was between 50 and 52 metric tons, i.e. up to 12 metric tons more than a conventional express train passenger car. Trucks (Görlitz II heavy) were developed just for the "Rheingold" series. They had to withstand high train speeds and had a wheelbase of 3.60 meters / 11 feet 9-3/4 inches. In addition, there were also 3 baggage cars, type SPw4ü, each with a length over the buffers of 19.68 meters / 64 feet 6-13/16 inches and facilities for goods in bond and for transporting pet dogs. The extremely elegant paint scheme for these prestigious cars attracted attention and interest. Initially, the color scheme for the outer surface of the cars was a kind of plum color with the pier panels in cream, later violet / cream with the widely known golden "Rheingold" lettering. The interior space of the cars offered the highest level of luxury, in first class even individually upholstered arm chairs with high backs. Attention was given to the different wishes of the passengers, so that there were compartments as well as large open parlor areas. The Rheingold had to face comparisons with the Orient Express right from the start, and the passengers enjoyed luxury in the parlor cars as only crowned heads of state had known it in the past. The interior conformed to the taste of that time. Famous German artists and architects participated, and the influences of the artistic avant-garde school for building and design in Dessau were reflected, with names such as Walter Gropius, Mies van der Rohe, or Paul Klee involved. The best care was offered to passengers at their seats in these trains running between Basle and Hook of Holland. Customs and passport control were done in the train during the trip, an exception for that time, but one that shortened the travel time considerably. All of the railroads that participated in the operation of the train were convinced of the significance and importance of this train, and it was natural that the most powerful and beautiful locomotives were used as motive power for the Rheingold. The outbreak of World War II brought the Rheingold to an abrupt end and its cars were stored during the war or put to special uses for the German army and the Red Cross and after 1945 for the occupation forces. The class 18.3 express steam locomotive with a tender, item number 39024, goes marvelously with this "Rheingold" express train passenger car set. Train D 475 can be modeled with this car set together with the 43252 sleeping car from the Märklin HO assortment. Prototype: German Sleeping and Dining Car Company (DSG) type WL4üg[e](-39) streamlined express train ("Schürzenwagen") sleeping car. Used in train D 475 that ran in the summer schedule of 1962 between Basle and Westerland (Sylt). Car routing from Frankfurt (Main) via Hannover and Hamburg Altona to Westerland. Model: The car has an mfx digital decoder and extensive sound functions such as teeth being brushed, gargling, toilets being flushed, yawning, snoring, and the staff speaking. The factory-installed interior lighting can be controlled digitally. Maintenance-free, warm white LEDs are used for the lighting. Different light functions can be controlled separately and digitally. The car has separable, current-conducting couplers. A pickup shoe is mounted on the car. The car has Görlitz design trucks and rubber corridor connections at the ends. Length over the buffers 27 cm / 10-5/8". Different light functions can be controlled separately and digitally. This car was used in the summer schedule for 1962 in train D 475. Train D 475 ran at least on a partial route (Hamburg Altona - Westerland) with German design three sleeping cars. Train D 475 can be modeled with this car together with the 43204 car set from the Märklin HO assortment. 43918 -- Express Train Passenger Car Set "Merkur"
The class 03.10 express train steam locomotive goes very well with this long distance train and is also offered under item number 37918 for the "Exclusiv"/MHI program in the Märklin assortment. Prototype: Type Tms 851 sliding roof car with a brakeman's cab and a handbrake painted and lettered as a privately owned car for the Märklin Magazin in Göppingen. The car looks as it did around 1990. Model: The sliding roof on the car can be opened. Length over the buffers 12.2 cm / 4-13/16". DC wheel set for the sliding roof car 2 x 700580. Prototype: Low side car, loaded with a model of a typical American bus. Model: The car has a special green paint scheme. The bus is constructed of metal, designed as a camp bus, with themes from the world of "Looney Tunes". The railroad car has Relex couplers. Length over the buffers 16.0 cm / 6-5/16". DC wheel set 4 x 700580. Annual model for members of the Märklin Kids Club. For licensing reasons this model is only available in the following countries: Germany, Austria, Switzerland, France, Netherlands, Belgium, and Luxembourg. Prototype: Freight train for transporting livestock, consisting of 2 German Federal Railroad (DB) type G10 boxcars without brakeman's cabs, 2 DB type Vh 14 livestock cars, 2 DB type Gl 11 Association design boxcars, and 1 DB type Pwg 14 freight train baggage car. Model: All of the cars are finely constructed and true to the prototype, with individual car numbers. The doors on the freight train baggage car can be opened. Train length over the buffers approximately 300 mm / 11-13/16". All of the models are a special edition and are not available separately. 82523 is being produced in a one-time series only for the "Exclusiv" / MHI (Märklin Dealer Initiative) program. 82523 is an add-on for 89791 and 88273. Prototype: DB Schenker Rail Germany, Inc. class 232 heavy diesel locomotive in a "traffic red" paint scheme. Model: The locomotive is extensively painted and imprinted. Engineer's cab details are suggested. The locomotive has a 5-pole motor. Both trucks powered. The triple headlights and dual red marker lights change over with the direction of travel. Maintenance-free, warm white and red LEDs are used for the lights. Length over the buffers approximately 95 mm / 3-3/4". Prototype: German Federal Railroad (DB) class 41 with Witte smoke deflectors. Model: The locomotive has a prototypical, extensive paint scheme and lettering. It also has freestanding headlight housings, triple headlights with warm white LEDs, and powerful 5-pole mini club motor. All of the driving wheels are powered. First time for this locomotive model with Witte smoke deflectors. Length over the buffers 112 mm / 4-3/8". One-time series only for the "Exclusiv" / MHI Märklin Dealer Initiative program. The 82523 and 89791"Livestock Transport" add-on car sets are the perfect accompaniment for this locomotive. Prototype: Bern-Lötschberg-Simplon Railroad (BLS) class 465. Model: The locomotive has a 5-pole motor. Both trucks are powered. The headlights are maintenance-free, warm white LEDs. The pantographs can be raised and lowered manually. The locomotive cannot take power from catenary; it only takes power from the rails. Length over the buffers 84 mm / 3-5/16". One-time series for the 100th anniversary of the Lötschberg Railroad. Prototype: German Railroad, Inc. (DB AG) class 150 heavy freight locomotive. Chrome oxide green version in Era V.
Model: The locomotive is mostly new tooling. The running gear has been improved particularly compared to earlier versions of this locomotive. It is an Era V version with Klatte vent grills, engine room windows that are not divided into parts and that have rounded corners, and rectangular buffers. The locomotive a red DB AG logo. The slotted switch for selecting catenary operation has been moved to the interior of the locomotive. Both trucks are powered. The triple headlights are warm white LEDs that change over with the direction of travel. The wheel treads are dark nickel-plated. Length over the buffers 88 mm / 3-1/2". Prototype: 1 slaughterhouse. 1 livestock loading ramp with 2 protective grills, 1 livestock transport truck, 1 German Federal Railroad (DB) type Vh 14 livestock car, 1 German Federal Railroad (DB) type Gl 11 Association design boxcar. 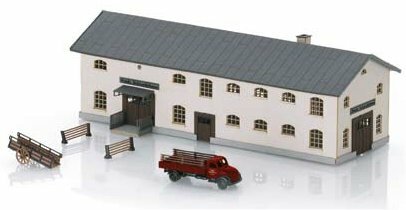 Model: This set consists of professional models of the building and loading ramp with all of the parts ready for assembly as a kit. The parts are made of high quality architectural cardstock painted realistically and laser cut for the highest level of precision. Area of the building with roof overhang L 125 mm / 4-15/16" x W 45 mm / 1-3/4". The 2-axle livestock car and the 2-axle boxcar are finely constructed and true to the prototype. The model of a truck is constructed of metal and has laser-cut finely detailed and painted "planking" on the flatbed. All of the models are a special edition and are not available separately. 89791 is being produced in a one-time series only for the "Exclusiv" / MHI (Märklin Dealer Initiative) program. Interior lighting available at better hobby and train specialty shops can be installed in the model building. 89791 is an add-on for 82523 and 88273. Prototype: 1 pressurized gas tank car, 1 type Tims-ww 858 sliding roof gondola car, 1 type Sdgmss deep well flat car, 1 chemical tank car, 1 type Ucs silo container car, all painted and lettered for the German Federal Railroad (DB). Model: The cars have close coupler mechanisms. Total length over the buffers 430 mm / 16-15/16". Prototype: German Federal Railroad (DB) class 139. B-B wheel arrangement. Built starting in 1959. Use: Passenger and freight trains. Model: The locomotive has a digital connector. It also has a motor with a flywheel. 4 axles powered. Traction tires. The locomotive has a close coupler mechanism. The headlights and the marker lights change over with the direction of travel. The pantographs can be raised and lowered manually and can take power from the catenary. Length over the buffers 103 mm / 4-1/16". The same is not the same. Part of the class E 40 freight locomotives were equipped with an additional electric brake from the class E 10 and were thereby able to be used on steep grades. These locomotives became the class 139 with the introduction of the UIC numbering system. Model: The locomotive has a die-cast metal frame and body. It also has a 21-pin digital connector with bridge plugs for conventional operation. It also has controlled high-efficiency propulsion with a flywheel, centrally mounted. 4 axles powered by means of cardan shafts. Traction tires. The triple headlights and dual red marker lights change over with the direction of travel. Maintenance-free, warm white and red LEDs are used for the lighting. The locomotive has separately applied metal handrails. The engineer's cabs have interior details. Length over buffers 22.5 cm / 8-7/8". The ES 64 developed by Siemens Transportation System (TS) in Munich for four power systems (Eurosprinter with 6.4 megawatts / 8,582 horsepower continuous rating) was planned and is already in use for heavy service all over Europe. It can run on the alternating current systems (15 kilovolts / 16.7 Hertz) in Germany, Austria, Switzerland, Sweden, and Norway, (25 kilovolts / 16.7 Hertz) in Denmark, Luxembourg, Northern France, and Hungary. Its area of use on direct current systems (3 kilovolts) stretches from Belgium, Italy, and Poland (1.5 kilovolts) to the Netherlands and Southern France. It can also be used on the so-called mixed systems in Slovakia and the Czech Republic. DB Cargo ordered 100 units as the class 189 (delivery time 2003 to 2005). This locomotive comes with 2 trucks (B-B wheel arrangement), has a total weight of 87 metric tons, a length over the buffers of 19,580 millimeters / 64 feet 2-3/4 inches and reaches a maximum speed of 140 km/h / 88 mph. This locomotive borrows its looks from the modern DB electric locomotives with their striking end shape. The fluted walls on the locomotive serve to reduce weight and also give the locomotive a striking appearance on the sides. In addition to the four required type SBS 2T pantographs, the roof also has the AC main relay, the current system selection relay, and the lightening arrester. 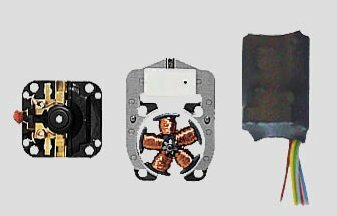 These components had to be mounted externally to allow enough space in the engine room for the direct current components and for train safety systems, which vary from country to country. Model: The powered rail car has a digital decoder and extensive sound functions. It also has controlled high-efficiency propulsion with a flywheel, mounted in the motor car. Both axles on the motor car are powered. Traction tires. The motor car and trailer car have factory-installed interior lighting. The dual headlights and dual red marker lights on the motor car change over with the direction of travel; they as well as the interior lighting will work in conventional operation and can be controlled digitally. The headlights and interior lighting are maintenance-free warm white LEDs. The headlights / marker lights on the motor car can be turned off separately on End 2 and End 1. As in the prototype, the trailer car has no headlights. Current-conducting couplers are included and can be inserted on both ends as a connection between the motor car and trailer car. The cars have interior details. There is a clear view in the motor car and the trailer car. There are separately applied ladders on the motor car. Length over the buffers for the two-car set 28.1 cm / 11-1/16". Prototype: German Federal Railroad (DB) class 23 passenger steam locomotive, 2-6-2 wheel arrangement, from the first production run. Built starting in 1950. The locomotive looks as it did around 1960. Version with black boiler bands. Use: Passenger trains. Model: The locomotive has a digital decoder and extensive sound functions. It also has controlled high-efficiency propulsion. 3 axles powered. Traction tires. The triple headlights change over with the direction of travel. The headlights and the smoke generator that can be installed in the locomotive will work in conventional operation and can be controlled digitally. The headlights are maintenance-free, warm white LEDs. A 7226 smoke generator can be installed in the locomotive. The locomotive and tender are constructed mostly of metal. There is a close coupling with a guide mechanism between the locomotive and the tender. The front of the locomotive and the back of the tender have a close coupler with a guide mechanism and an NEM coupler pocket. Minimum radius for operation is 360 mm / 14-3/16". Brake hoses and piston rod protection sleeves are included. Length over the buffers 24.5 cm / 9-5/8". The Class 23. Right after World War II the new German Federal Railroad still had to rely on steam motive power. Henschel developed the class 23 to cover the demand for passenger and lightweight steam locomotives. The 105 units built from 1950 to 1959 had a 2-6-2 wheel arrangement and were equipped with a welded frame, boiler, and tender. The maximum speed was 110 km/h / 69 mph forward and 85 km/h / 53 mph in reverse, which was enough to equip several locomotives with shuttle train controls. These locomotives performed their task without a great deal of fanfare in the areas of service planned for them. On January 1, 1968, the class 23 was changed to the computer designation class 023 and the last units of this class remained in service on the German Federal Railroad network until 1976. During this period, they were assigned to the Crailsheim District. Road number 23 105 also wrote German railroad history. It was the last German Federal Railroad steam locomotive put into service, which lent it museum status. However, it was a victim of the catastrophic fire on October 17, 2005 at the Transportation Museum in Nürnberg, where it was heavily damaged. There are several examples of the class 23 preserved as museum locomotives, some of them even operational, due to the good condition of all of these locomotives, when they were retired from regular service. Prototype: Swiss Federal Railways (SBB) class Re 4/4 II (class 420). Rebuilt version in a red basic paint scheme. The locomotive looks as it currently does for Zürich S-Bahn service. Model: The locomotive has a digital decoder and extensive sound functions. It also has controlled high-efficiency propulsion. 2 axles powered. Traction tires. The triple headlights and dual red marker lights change over with the direction of travel, will work in conventional operation, and can be controlled digitally. The headlights can be turned off separately at Locomotive Ends 2 and 1. When the headlights are turned off at both ends of the locomotive, the double "A" light is functioning at both ends. The lighting is maintenance-free warm white and red LEDs. The locomotive has separately applied metal grab irons on the sides and at the ends. There is a representation on the sides of the air conditioning. The couplers can be replaced by end skirting included with the locomotive. Length over the buffers 17.1 cm / 6-3/4". Prototype: German Federal Railroad (DB) class E 10.12 express locomotive with aerodynamic ends ("Bügelfalte"/"Pants Crease"). Production run with high-performance trucks and buffers clad with streamlining. The locomotive looks as the prototype did starting in May of 1967. Model: The locomotive has a 21-pin digital connector. It also has controlled high-efficiency propulsion, centrally mounted. 4 axles powered through cardan shafts. Traction tires. The triple headlights and dual red marker lights change over with the direction of travel. The headlights are maintenance-free warm white LEDs. The locomotive has separately applied metal grab irons. It also has interior details for the engineer's cabs. Length over the buffers 18.9 cm / 7-7/16". The passenger car set to go with this locomotive can be found in the Märklin H0 assortment under item number 43857.